Discover affordable lease deals at Stanley Chrysler Dodge Jeep Ram Brownfield, and get behind the wheel of a new Chrysler, Dodge, Jeep, Ram today! Not sure is leasing is right for you? Learn about differences between leasing and buying, generate your monthly payments with our handy lease calculator, and contact an associate at our Brownfield location with any questions you may have. Lower monthly payment: In many cases, you will almost always have a lower monthly payment with a leased vehicle. This is because you are only paying for the depreciation of the vehicle, not the total cost. Using our lease calculator will help you easily determine your right monthly payment! Save in repairs: Many leased vehicles remain under warranty and some even come with maintenance plans so you will have a predictable cost of ownership. No worries about selling a trade in: You simply drop your leased vehicle off at the dealership when the contract expires. 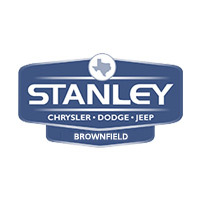 When you’re ready to lease your new Chrysler, Jeep, Dodge, or RAM, value your trade-in and stop by Stanley Chrysler Dodge Jeep Ram Brownfield near Lamesa for a test drive today where our award-winning team is ready to help you.